Overall very nice copies. The fit to my McClellan saddle was good although I had to do a bit of trimming and thinning to make the the connecting leather web fit the saddle fittings. The leather was a bit stiff from storage but I was able to soften it up with leather treatment oils. 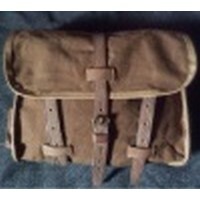 he bags are very well assembled and the brass fittings are excellent replicas of the original. The bag liners and smaller ration bags are a nice touch. Good color. A nice product at a good price. Well worth the money. Very nice quality,good color, excellent brass fittings properly blackened. Worth the money! They are now attached to my 1904 McClellan saddle. Stunningly quick delivery... and good saddlebags. Perhaps smaller than expected, but in reality they are a neat and useful size. Full marks, all in all. First rate customer service. Ultra fast shipping. The product itself is top shelf. Components and construction are of good quality and as far as I am able to tell, accurate to the originals. A great set of saddlebags which will serve me the rest of my life. Wonderful product. I bought the bags as something a little different for carry on aircraft luggage and the amount of stuff I want to drag about will fit comfortably in the pockets. Having all the internals is a bonus; as most of the other similar products either come without, with no facility for them, or they are a cost option The down side is that the leather is a bit stiff, but hey its new and designed to be so, a bit of use will remedy that. The real downer was the bags got caught at the local sorting office and I had to wait over the weekend for them to appear. I know I shouldn't be excited about a leather bag (that's a right girlie thing) but I am. Thanks for making this product available in as an authentic manner as is possible. And I think I am in danger of losing the bags to my daughter for her school books! The postman knocked on my door yesterday and delivered my saddlebags, was i surprised..?, superfast delivery !! normaly it takes twice the time when ordering from another country to get the goods up here in the north and the saddlebags were really nice, very high quality and they do look and feel like the originals, the bags are going to look realy nice hanging behind my saddle.